A major report released today by the humanitarian aid and human rights group No More Deaths paints a frightening picture of systematic and widespread abuse by U.S. Border Patrol agents of migrants in their custody. At the same time, it demonstrates the brutality inherent in the agency’s very existence and operation. A major report released today paints a frightening picture of what happens to the individuals who have the misfortune to fall into the clutches of the U.S. Border Patrol. The report documents systematic and widespread abuses perpetrated by Border Patrol agents of the people they apprehend, detain, and deport in the never-ending war on unauthorized migrants in the U.S.-Mexico borderlands. Prepared by No More Deaths, a humanitarian and human rights organization in Arizona, "A Culture of Cruelty" criticizes what it characterizes as the Border Patrol’s “institutional culture” for giving rise to “abuse, neglect, and dehumanization” of migrants. At the same time, it demonstrates—even though it doesn’t assert this conclusion—the brutality inherent in the agency’s very existence and operation. Based on more than two-and-a-half years of interviews with almost 13,000 individuals who had been under Border Patrol custody, the report makes for shocking reading. 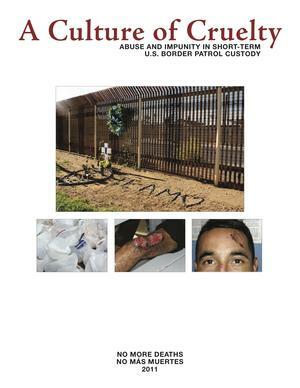 Among its findings: 10 percent of apprehended migrants, including teens and children, reported physical abuse by agents or Border Patrol dogs; 86 percent of individuals in need of emergency medical treatment or medication were not given any; agents denied water to 863 people and failed to provide sufficient water to 1,402 individuals; and increasing psychological abuse is occurring, including death threats, sleep deprivation, and the playing of loud, continuous music in detention facilities. It is for such reasons that No More Deaths calls for, among other recommendations, the establishment of some sort of independent oversight body in which community and human rights groups would play a major role in watching over the Border Patrol. Such recommendations, if implemented, would likely lead to better conditions for migrants who come in contact with the Border Patrol and the larger Department of Homeland Security (DHS) of which it is part. However, the enforcement practices that are not defined as irregular, and therefore would likely not be regulated, are often even crueler. For example, migrants interviewed for a separate survey, who had been living in the United States before their arrest and deportation, had, on average, 2.5 children. Almost half of them asserted that all of their children in the United States were U.S. citizens. Pretty it is not—and cruel the Border Patrol will always be as long as its job is to chase people like animals and arrest them for the “crime” of coming to the United States to work or to unite with their loved ones. 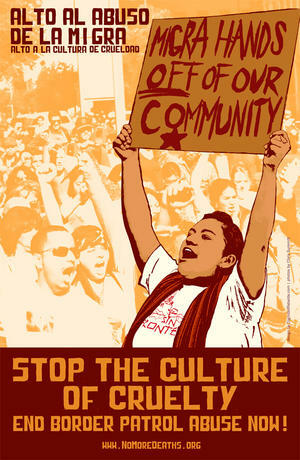 For more from the Border Wars Blog, visit nacla.org/blog/border-wars. And now you can follow it on twitter @NACLABorderWars. See also the May/June 2011 NACLA Report, Mexico's Drug Crisis; the Jan/Feb 2009 NACLA Report, Taking on Policy in the Obama Era; and the May/June 2007 NACLA Report, Of Migrants & Minutemen. Subscribe to NACLA.